The conceptual design and scope of TMT’s Refrigerant Cooling System (REFR), which was executed and developed by a close Chinese-North American collaboration, successfully passed a recent conceptual design review. This system will be used to provide cooling to electronics enclosures mounted on the telescope structure. The system also maintains several TMT instrument enclosures at subzero temperatures to reduce thermal backgrounds for near-infrared observations. The review committee at the project office in Pasadena assessed that the REFR team successfully completed the conceptual design phase and is now ready to proceed to a combined Preliminary and Final Design Phases, provided that minor key actions are addressed. The formal review panel included TMT stakeholders and high-level international experts in industrial gases and cryogenics field, including representatives from Quantum Technology Corporation in Canada, and Microgate Engineering in Italy. Several TMT adaptive optics and on-instrument wavefront sensing systems, including NFIRAOS, will be cooled well below ambient temperature to reduce the thermal background for near-infrared observations. As a result, TMT REFR system shall maintain these optical enclosures at a temperature of around -30°C (-22°F). The REFR system will also be used to cool electronics and other heat dissipating enclosures to ambient temperature (approximately 0°C or 32°F) at several locations on the telescope structure. If not controlled, the heat released from these electronics could generate convective motion of air pockets at different temperatures, creating turbulence across the optical light path that would degrade scientific performance. The key deliverables of this review included the REFR system requirements, design concept, interface requirements with the TMT’s summit facility, the science instruments and the AO system, as well as concepts for heat-exchange control and system maintenance. The REFR system must meet strict technical, environmental, functional and operational requirements. The safety of its operations must also be consistent with industry standards and best practices. The REFR team presented the result of their detailed trade-off study of candidate refrigerants, which showed that liquid carbon dioxide CO2 is the preferred cooling solution for TMT. It minimizes the heat dispersion from electronics and other equipment on the telescope. It provides efficient cooling at temperatures of both -30C and ambient, is nonflammable, and is compliant with the Montreal Protocol (an international treaty designed to protect the Earth’s atmosphere ozone layer). The REFR conceptual design phase is the result of an intensive consultation and peer review process involving the Technical Institute of Physics and Chemistry of the Chinese Academy of Sciences (TIPC), the TMT Systems Engineering Group, and the design team for the TMT Narrow Field AO System (NFIRAOS) at the Herzberg Astronomy and Astrophysics Research Centre in Victoria, Canada. 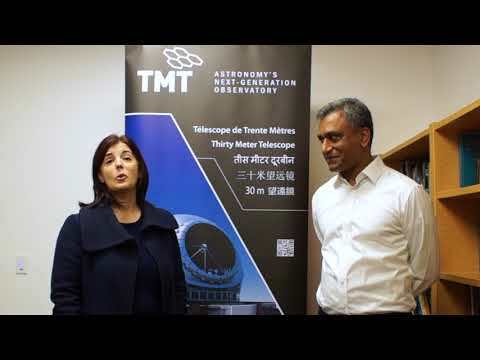 The Technical Institute of Physics and Chemistry is one of the consortium institutes of the TMT-China partnership within TMT International Observatory. This successful REFR conceptual design has delivered a technically viable solution. Prototyping and design activities will soon begin to bring TMT’s refrigerant system to its next development phase, which is expected to be complete in late 2019. Note: Some parts of the TMT science instruments themselves, including detectors and optics for infrared instruments, must in many cases be cooled to lower cryogenic temperatures. Such cryogenic cooling was not covered by this review.